Well, it’s been a long week and weekend. Labor Day weekend was not kind to me at all (hence my absence); in fact, it was quite possibly the worst weekend of my life. Surprisingly (at least to me), I did slow down enough because of it to get some knitting work done and even managed to get 50% of the way through a pair of socks. That’s me, always looking for any bright side I can. I’ve debated how personal I want to make this blog, and I’ve decided to just write it, but to keep it very short. No use putting a complete downer on things. This is one small part of my recovery from the whole thing, and it’s not something that a lot of people talk about. My big September surprise I mentioned a couple posts back was a baby sweater, and not one for my niece/nephew. It was going to be for our son/daughter. I was so very excited. We actually found out the day after adopting our kitten. We were due in March, and I was about 11 weeks along. Yeah, past tense. Unfortunately, on August 31st, late at night, we lost our little angel. And I know it was “for the best” and everything and that it was early chromosomal issues (or so I’m repeatedly told), but it’s still been a very difficult thing (both physically and emotionally) to deal with. Some days are better than others, and I know it’s going to continue to be that difficult for a long time. Luckily, I have an amazing family and the world’s best husband. They’ve been so supportive and kind this whole time. Luckily, the doctor has said there’s no reason we can’t try again and have a healthy happy baby next time. Although, I’m fully aware of how terrifying next time will be because of all this. This is where knitting came in. It’s been one of the best therapies I could’ve asked for. The sweater went away, as did the blanket for my niece/nephew (the latter more temporary than the first). I went through the list in my head and realized that I had promised my friend/coworker a pair of socks. I opted for the Summer Slice by Cassandra Dominick. Mine aren’t as cute as Cassandra’s as I chose just one color to work with, but so far, I’m really happy with how they’ve turned out. I even managed to cast-off the first one last night, which made me so happy. The sock you see in the picture above is sock 1. It’s not been blocked yet, which explains how messy the knitting still looks (ah, the miracle of blocking!). 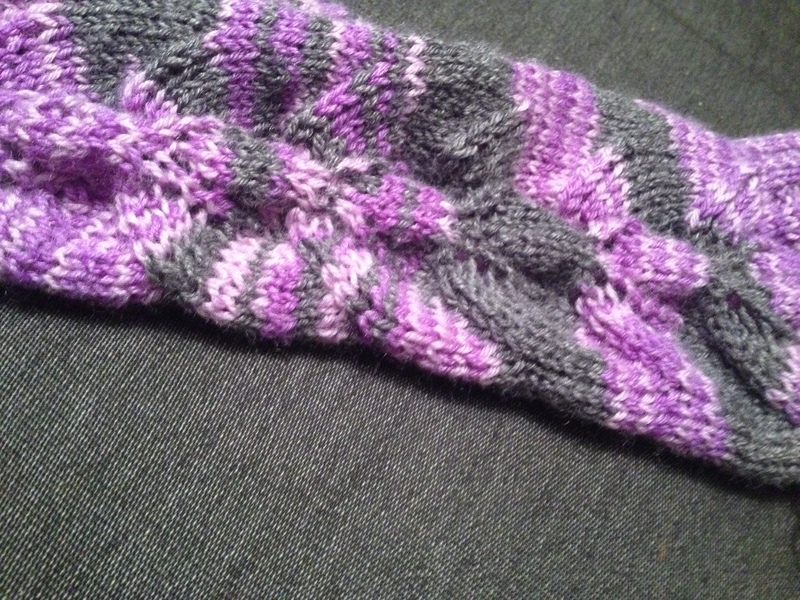 I just really wanted to share the lace detailing in the leg of the sock. If you’re like me and have fairly large legs, this is the sock pattern for you. You can work with as many stitches as you want/need with this one. The design is only across 23 stitches, and the rest is up to you. As easy as this has been to knit up, I’m considering keeping this pattern on hand for other socks I may make in the future. It’s easily customisable. I’ve also gotten quite a bit of work done on Ken’s sweater. I’m nearly done with the body (I wish his torso wasn’t so long some times! ), so soon I’ll have to go back to the worksheets and learn how to do the sleeves. I’ll be happy to be done. I’ve signed up to do the Plus Knits class on Craftsy by Marly Bird, and I really want to get started. So far, I really like the class, and next, I’ll be making the duct tape body form, which seems like it’ll be endlessly fun (though a little mortifying because I know exactly how big a girl I am). My dad was awesome and blew up my charts for the Christmas stockings, too. Now I can keep them in my chart keeper and they won’t be so hard on my eyes. After working on the Summer Slice sock, too, I’ve realized how easy it could be to do the Christmas stockings toe up, as well. I very much prefer starting at the toe, so this will be under heavy consideration for the rest of the stockings. Hope your projects are also coming along nicely! So sorry for your loss, thank you for taking the time to share with us such a deeply personal thing. The sock(s) look beautiful, I love that colorway and can’t wait to see it blocked. I haven’t done toe up socks before, (cuff down kind of gal) so I always find it interesting to hear/see people’s progress (the whole heel thing throws me), thanks again for sharing. I have been planning to make a duct-tape form myself. Same as you, I dread seeing it in all its full-figured glory. I debated it, and decided to come back to write another comment. I lost my daughter at 24 weeks gestation on Easter Sunday. I won’t say that I know how you feel, because I’m sure that I don’t. I will say that I can imagine how devastated you are; and also, that it gets better, but never goes away. I keep trying to figure out the right thing to say. I’m so sorry to hear that you lost your daughter. The experience was the most painful I’ve ever experienced, emotionally and physically. I’m so sorry for your loss. My deep sympathy goes out to you on the loss of your little one. I’ve never personally experienced a loss like that so I can’t say I know it will get better. We just have to move on when difficulties happen and let God ‘s peace do it’s work.